This document has not been updated for Java. The API documentation for Java is complete, but many ReQL articles still have examples in other languages. We’ll be updating each article after the Java driver is officially released. Don’t see the recipe you’re looking for? Request or add a recipe by opening an issue on GitHub. Another way to create a database is through the web UI. You can reach the web UI at http://HOST:8080. Click on the Tables tab at the top and then use the Add Database button. The easiest way to rename a database is to use the config command to access the db_config system table, and then simply use the update command. Note that you can omit the db command if you’re creating a table in the default database on your connection (set to test unless specified in connect). Another way to create a new table is to use the web UI. You can reach the web UI at http://HOST:8080. Click on the Tables tab at the top of the page and then use the Add Table button. The table command returns a cursor; use the next or each command to iterate through the result set, or toArray to retrieve the set as an array. Similarly, you can use the r.or command to filter based on one of many conditions. For many ReQL commands, you can also use a JSON-style nested syntax that allows considerably more flexibility. Read “Accessing nested fields” for more information. 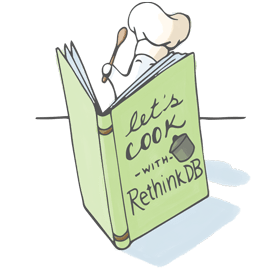 Read about creating secondary indexes in RethinkDB. If you’re using a command that returns a stream and want to retrieve all of its results at once in an array rather than iterating through them with the cursor object, you can coerce it to an array using the toArray command. See the data type documentation for more detail about streams. This is equivalent to calling SELECT name, age FROM users in SQL. // Will return Martin, Martinez, Marshall etc. // Will return Williams, Jones, Davis etc. // Will return Williams, Miller, Allen etc. Retrieve all users whose name is “William” (case insensitive). // Will return william, William, WILLIAM, wiLLiam etc. If you want to perform a query that returns aggregations on different fields together, this is a canonical use case for map-reduce. Suppose a data set that lists top movies, ranked by user vote. You’d like to get the total votes and the average age of the top 25 movies: the avg() of the year column and the sum() of the votes column, ordered by the rank column to get the range 1–25. To perform this, map the first 25 movies into a new result set, adding a count column, then reduce each row of the mapped result set into a total for each field (votes, year and column). Then use do to return a result set with the total votes and the average year, computed by dividing the sum of the years by their count. We’re working on an easier syntax for performing multiple aggregations after group commands. Follow issue 1725 to track progress on this. Using a similar technique to the last recipe, we can use branch and replace to maintain a document’s updated_at and created_at fields by either inserting a new document or updating one depending on whether a document with a specified ID exists. Use the commands toEpochTime and toISO8601 to convert back. It’s possible to increment a field value in a document—for example, a counter—in one step on the server. Use default to ensure that if the count field doesn’t already exist in the document, it’s added correctly, rather than letting add throw an error. There are multiple ways to paginate results in RethinkDB. The most straightforward way is using skip and limit (similar to the way SQL’s OFFSET and LIMIT work), but that’s also the least efficient. It’s more efficient to use slice, and even more efficient to use between with a secondary index. If you have a secondary index, you can use the between command in conjunction with orderBy and limit. This is the most efficient way to paginate, but requires looking up values in the secondary index field to find the first record of each page. Suppose you wanted to paginate through a set of users, 25 at a time. You could get the first 25 records efficiently just with limit. For each successive page, start with the last name in the previous page. We pass the lastName saved from the previous set to between as the start index. For the end index, we pass null to return documents from the start index to the table’s end. The leftBound parameter tells between not to include the first record, since it was already returned as part of the previous page. You can compute the average value of a field with the avg command. In this case, you can do a pivot operation with the group and coerceTo commands. Note: A nicer syntax will eventually be added. See the Github issue 838 to track progress. (We also use the technique for renaming a field, described above, to give the names “reduction” and “group” more useful names of “invoices” and “month.”) You could use any combination of the ReQL date/time interval commands in the group, or work with the date/time as a native object. Then you can use that index in the group function. This query would return the highest-value invoice for each day. Efficiently generating monotonically increasing IDs in a distributed system is a surprisingly difficult problem. If an inserted document is missing a primary key, RethinkDB currently generates a random UUID. We will be supporting additional autogeneration schemes in the future (see https://github.com/rethinkdb/rethinkdb/issues/117), but in the meantime, you can use one of the available open-source libraries for distributed id generation (e.g. twitter snowflake). inserted – Number of new documents added to the database. deleted – Number of documents deleted from the database. replaced – Number of documents that were modified. unchanged – Number of documents that would have been modified, except that the new value was the same as the old value. skipped – Number of documents that were unmodified in a write operation, because the document is not available to be deleted or updated. The document might have been deleted by a different operation happening concurrently, or in the case of a get operation the key might not exist. errors – Number of documents that were left unmodified due to an error. Sometimes you may want to write a ReQL document with a dynamic key—the field name is stored in a variable. You can do this with the object command, which takes a list of keys and values ((key, value, key, value ...)) and returns an object from them. For a practical example, imagine a data set like the one from the pivot example, where each document represents a student’s course record. You can accomplish this with object and a pivot. You might want to “tag” the tables to make it clear which changes belong to which table. Also, you can use changes with each query rather than after the whole.